A Green New Deal is the idea of an economy based on renewable energy, green jobs, and other policies that combat climate change. 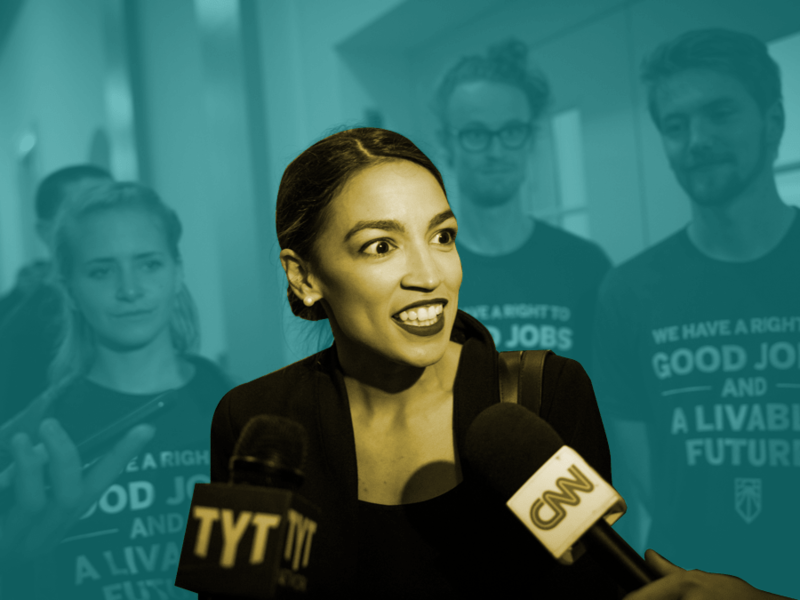 The idea was recently proposed by newly elected Representative Alexandria Ocasio-Cortez; former President Obama put out a stimulus plan in 2008 that included elements of a Green New Deal. But the term was first coined over a decade ago by the journalist Thomas Friedman. Friedman talks about what possible green proposals could entail and what obstacles it might face. Thomas Friedman is the Foreign Affairs Op-Ed columnist for New York Times, and the author of Hot, Flat, and Crowded: Why We Need a Green Revolution–and How It Can Renew America (Farrar, Straus and Giroux, 2008). He’s based in Washington, D.C.
IRA FLATOW: This is Science Friday. I’m Ira Flatow. Perhaps you’ve heard the term now, the Green New Deal. The idea has been gaining lots of support by lawmakers, like representative Alexandria Ocasio-Cortez. But the term Green New Deal is really more than 10 years old. Journalist Thomas Friedman first came up with the term. So what might a green proposal look like? What would need to change? And would it really work to curb climate change? What are your thoughts about a Green New Deal? Do you have questions about how it might work? Our number is 844-724-8255, 844-SciTalk. And Thomas Friedman joins us to talk about all of this. He’s Foreign Affairs columnist for the New York Times. His latest book is Hot, Flat, and Crowded, Why We Need a Green Revolution– And How It Can Renew America. Welcome back to Science Friday, Tom. THOMAS FRIEDMAN: Great to be with you. IRA FLATOW: OK so this was your idea, the Green New Deal. It’s not a proposal or set of laws, it’s an idea. Give us some background on this. THOMAS FRIEDMAN: Yeah so I came up with this in a column back in 2007. And the context, Ira, was this. We were in the depths the darkest moments of the Iraq war. It was clearly not going to work to transform Iraq or the Middle East. We were about to enter the deepest recession since 1929. And there was a sense that China was really ascendant and America was decent. And basically I came up with the idea of a Green New Deal as a way of addressing all of these things at once. The idea was, basically, making America the cleanest, greenest leader of the Clean Tech Revolution, which would drive down oil prices and give us a way to reform the Middle East. Maybe drive reform there, outside of an invasion, by actually just lowering the price of oil and really forcing reform. It would make us more innovative. It would make us a moral leader in the world. It would make us more competitive with China. The idea was it would help us get our groove back. And that’s really where the idea came from. IRA FLATOW: How has it morphed in those 10 years to what people are talking about today? THOMAS FRIEDMAN: Well, the first morphing happened when President Obama picked up the idea. He read the column and then Hot, Flat, and Crowded in the book and he made it part of his early stimulus plan. And we tend to remember the stimulus, Ira, for what failed, Solyndra. But actually the stimulus gave great stimulation to a lot of solar, wind, and battery technologies. Tesla grew out of that, among the other companies. And so I think President Obama did a very good job with it on balance. And then he tried to go for a carbon tax. We got really close. The idea failed for political reasons. And then the idea really went into remission, I would say. IRA FLATOW: And so it has been revived by some of the new freshmen Congress women. THOMAS FRIEDMAN: Alexander Ocasio-Cortez, the Sunshine Movement, which is independent. A group of young people have brought the idea back to the public consciousness. I think it’s fantastic that they have. They’re defining it in their way, which I think is also fantastic. I say let 1,000 flowers bloom. And my own ideas have become much more refined as well, in terms of how I think about it going forward. I hope all of these get into the public space and politicians begin to pick up on it. IRA FLATOW: Well when you say your ideas have been refined more, what would be the biggest redefinition of your idea? THOMAS FRIEDMAN: Well I think it’s really sharpened my focus. My main idea was two-fold. One was political. I’m a big believer that to name something is to own it. If you can name an issue, you can own the issue. And my problem with green, all the years, was it felt to me like it had been named by the people hated it. And they named it, liberal, sissy, girly man, unpatriotic, uneconomic, vaguely French, vaguely French. And my goal was to rename green, geopolitical, geostrategic, economic, patriotic, capitalistic, innovative. Green is the new red, white, and blue. So part of it was to re-energize the movement. As I said, in my book, I’m not a nice green, I’m a mean green. I think there’s this sort of sense over the years that the green movement had to be apologetic. Would it be OK, sir, if we just put up a solar panel next to your coal-belching furnace? And my attitude is I’m not apologetic about anything. I’m as tough-minded– I’m a mean green– as any oil and gas guy. Because I think that green is a way to actually revive or propel the American economy. Make us more energy independent, more geopolitically secure, and more innovative. And I’ll fight any fossil fuel guy on that position. IRA FLATOW: So is this the right time then, because we have some of these new Congress women who are willing to fight along with you? I mean, Alexandria Ocasio-Cortez would seem to fit exactly into that kind of personality that needs to bring this thing forward. THOMAS FRIEDMAN: And I love that. And I love it from the Sunshine Movement as well. My advice, to them and to myself, is, I have a chapter in Hot, Flat, and Crowded, it’s one of my favorite. It’s called, If It Isn’t Boring, It Isn’t Green. And what the chapter is about is, everyone wants to be Al Gore, I’d like to be Al Gore, to win a Nobel Prize, and an Oscar, and an Emmy, and you know. But some of the real heroes of the Green Movement, I profile one in the book, are people like the guy from NRDC who figure out how to reduce all the power consumption in every Coke-dispensing machine in America. You know when you change the power consumption in every Coke machine, you really impact the climate. Now to do that, though, you have to understand how Coke machine works and you have to understand how it interfaces with a utility. Now there is no more boring institution on God’s green Earth than a public utility, basically. But you got to kind of know this stuff to really know where the leverage points are. And that’s something I had to learn. I think it’s what anyone wants to really have an impact here has to learn, because I’m a big believer, there’s only one thing as big as Mother Nature, and that’s Father Greed. That’s the marketplace. And to me a Green Revolution is, how do I reshape the marketplace with the right regulations, standards, and incentives and taxes, so it really will propel all of these green opportunities and innovations and technologies forward? IRA FLATOW: By couching it as a marketplace changer, then that’s sort of a way of taking the tree-hugger aspect out of it and making it sound more capitalistic. THOMAS FRIEDMAN: Well the way I present it when I’m talking to climate doubters, I say, look, you don’t believe in climate change, I do. That’s between you and your beach house. But let me tell you what we can both believe in. We can both believe in math. There are 7.4 billion people on the planet. And according to the UN, by 2030, there’ll be 8.2 billion. There’ll be another billion people here in less than in roughly a decade. Now that means if those billion people want to drive in American-sized cars, live in American-sized homes, and eat American-sized Big Macs, we’re going to burn up, choke up, eat up, burn up, smoke up, and devour up this planet faster than even Al Gore predicts. So what does that mean? It means only one thing. Clean power, clean energy, energy efficiency, and clean water have to be the next great global industry, otherwise we’re going to be a bad biological experiment. So who here believes– please raise your hand in this group of climate deniers– who believes America can be the most powerful and wealthy country in the world and not participate in the next great global industry? And that’s how I frame it. Because if you believe that, you’re a wimp. And we greens, we are the red, white, and blue. We are the tough guys. You are the surrender monkeys. IRA FLATOW: But some of the proponents of the deal say, we want to bring other social change in with it. Health care systems, things like that. Is that muddying the waters, for lack of a better term? THOMAS FRIEDMAN: Yeah, look, they’re going to face a lot of criticism on that. And I think they’ll have to navigate that their way. I’m not against it, as long as you can find ways to pay for it and sell it and build a majority in Congress for it. So I don’t want to prejudge anything, because I think our politics is a really fluid place right now. Right now, I love their energy. Put it out there. Put your ideas out there. Let it compete in the marketplace of ideas and let’s see what sticks. IRA FLATOW: Let’s go to the phones. 844-724-8255 Alexander in Jersey City, hi, welcome to Science Friday. ALEXANDER: Hi. I just want to say thanks for the show. I love listening to it, but I would like to take a little issue with this idea of a green new economy. You said it at the outset of the program that this is not being innovative. The idea has been around for quite a long time. I, myself, have been working for over a decade in the space of risk reduction and resilience. And my issue with the likes of Ocasio-Cortez and others is they’re jumping on an antiquated set of technologies and ideas and methodologies. And what we really need to be looking at is, how do we make our cities and our assets, in terms of infrastructure and where we live– considering the rapid rate of global urbanization– how do we make our cities more resilient? And that is really, I think, where we see sustainability. And this whole– I mean, the word green, itself, is becoming quite antiquated. They’re being subsumed into this practice and methodology of resilience. And you can see this with Rockefeller’s 100 Resilient Cities program. Or the United Nations has a global platform for urban resilience. And so, while I like and appreciate the positive impulse on the topic in this current negative environment, when it comes to climate change, we have to understand that the sustainability is, while helpful, it really only becomes practical in dollar terms when we can protect the assets from the negative effects and impacts of climate change. THOMAS FRIEDMAN: Well, it’s a very valid point and I would simply say, Ira, to your question, what is my version of the Green New Deal today? Didn’t really answer that. It’s really to focus on the four zeros. And my friend, Hal Harvey, the CEO of Energy innovations came up with these. That is, I think our goal should be zero waste manufacturing, zero net energy buildings, zero emission vehicles, and zero carbon electricity generation. And what the government’s role should be is to set the standards that we want in all four of those areas. Lay them out, raise them gradually every year, as the state of California does. And then simply say to the innovation community, let us 100 flowers bloom. Whoever can reach these standards, aimed at these four zeros, we will reward in the marketplace. And so I’m really tightly focused around those things and not trying to get into the jobs question or health care. But if you can make that work, God bless you. But that’s where my Green New Deal is focused right now. IRA FLATOW: Let’s go to Lawrence, Kansas. Bob, hi, welcome to Science Friday. BOB: Hi. It’s wonderful, the topic that you’re talking about. One of the things that I see that’s been a problem, I’ve been active in these things for a number of years. My first encounter was the work with Wes Jackson at The Land Institute. THOMAS FRIEDMAN: A good friend of mine, wonderful man. Wonderful man. THOMAS FRIEDMAN: Other friends of mine. BOB: These people are bringing really doable technologies. IRA FLATOW: Bob, do you have a question you want to discuss? BOB: Yeah, my question is, Tom, how do we deal with the bipolar disorder that is currently the political polarization around the issue of sustainability, green technology? How can you get the right-to-life movement on the right side to see that right-to-life involves an expanded version of life and sustainability on the planet to avoid extinction? THOMAS FRIEDMAN: Well, you just said. We’re not going to get everybody onboard, because I don’t think, without some form of making birth control and family planning technology to more people available who want it, that we can ever get where we need to go on the green agenda. But, as I alluded to earlier in response to Ira’s question, again, I think, the way I do it is I frame this as an innovation opportunity, as an economic opportunity, as a moral leadership opportunity, and as actually geopolitical strategy. And if you put it in those terms– it’s not that I don’t want to or believe in the climate arguments, but if you put it in those terms, it becomes harder for people to resist. IRA FLATOW: I’m Ira Flatow. This is Science Friday from WNYC Studios. Talking about the Green New Deal. I’m oh so tempted to say New Green Deal. Which I guess would be just as accurate. Tom Friedman, what about the bigger question of how are we going to pay for this? THOMAS FRIEDMAN: Well, again, let’s just take the issue– I was just talking to someone the other day– solar panels. My son-in-law happens to work for Canadian Solar and so I know, through him, a lot about what’s going on. Solar generation today, with the subsidy, can beat coal straight up now. Certainly can compete for it in any area. Wind, you know, Ira, it’s very interesting, I believe the top– I might have the number wrong, people can check it– but I think it’s the top eight wind states in America, all red states. THOMAS FRIEDMAN: Texas, Wyoming. The number one is Wyoming. Yeah. Kansas. So it’s really there. It’s getting people to get over this sort of cultural resistance that climate is somehow a liberal issue. And understanding, and this has been my whole objective, that it’s innovative. It’s about power. It’s about economic growth. It’s about an America that can really lead the next great global industry. And that’s how I try to frame it. IRA FLATOW: Do you think we have turned a corner in climate change, at least talking about it? Actually a whole hour of Meet the Press was dedicated to climate change. I almost fell off my seat when I saw that. Do you think people are talking about it a little bit more as part of a daily discussion? THOMAS FRIEDMAN: I think they are, but I think people don’t realize. Look, Ira, we have the biggest electric utility in California going bankrupt, basically, because its technology allegedly triggered all these wildfires. I think this is coming at us much more quickly. And we are, I don’t know, five or eight years away from this becoming the dominant issue. I wouldn’t be surprised if in the 2020 campaign, god knows what’s going to happen over the next two years, in terms of disruptive climate events, and I hope there’s none, but I wouldn’t be surprised if Mother Nature just forces her way into the 2020 campaign. IRA FLATOW: There is you know there’s such political talk about whether these new young Congress people coming in can drag– what is the average age in Congress? 106 or something like that? Drag these other people with them. Do you think that’s possible? THOMAS FRIEDMAN: I do and at some point, and this is what I love about them, they’re just not ready to take no for an answer. They’re just not ready to go into the corner and behave. And I love the example they’re setting for other young people, because sometimes when I talk to young people about this issue, they say, well, I tweeted about it. They say you tweeted about it. That’s like firing a mortar into the Milky Way galaxy. Exxon Mobile, they’re not on Facebook, they’re in your face. They’re not in the chat room, they’re in the cloak room of the US Congress, sometimes with bags of political donations. That’s where the green movement has to be. You have got to play tough. You have to be a mean green. IRA FLATOW: And you have to be on the right congressional committee. THOMAS FRIEDMAN: You have the right congressional committee. But also, paired with that, you have to have realistic proposals that can cross party lines and that are framed in a narrow and focused enough way that people can say, OK, I get that. I’m ready to get behind it. IRA FLATOW: All right, we’re going to talk more with Tom Friedman. We have to take a break. Our number, 844-724-8255. If you’d like to tweet us, you can tweet us @scifri. We’re talking about the New Green Deal, Green New Deal, whichever way you’d like to say it, with Tom Friedman. Stay with us. We’ll be right back after this break. This is Science Friday. I’m Ira Flatow talking with Thomas Friedman, foreign affairs columnist for the New York Times and author of Hot, Flat, and Crowded– Why We Need a Green Revolution, How it Can Renew America. Maybe they’ll reissue that book. THOMAS FRIEDMAN: It’s still in print. IRA FLATOW: Still in print. You can read the original blueprint. THOMAS FRIEDMAN: Exactly, in paperback. IRA FLATOW: In paperback. Is there going to be a litmus test for people who want to get in on the new deal here? Like the Sunrise Movement says, you can’t take any money from fossil fuel companies. THOMAS FRIEDMAN: Well, again, I think before we’re done, because of the way that Sunrise and Ocasio-Cortez have put this on to the Democratic agenda again, I suspect we’re going to see, Ira, four or five versions of this. And some may say, hey you can’t take any money from fossil fuel companies. Some may have a different view of it. Right now, I want to see everybody getting their own version of it on the table. And let’s see what wins in the marketplace of ideas. IRA FLATOW: Well let’s see what’s on the phone. Let’s go to Oakland. Kevin in Oakland, welcome to Science Friday. KEVIN: Oh, hi, I’m so excited to be talking with you. So my discussion topic is regenerative agriculture. And I’d really like to see some soil legislation to regenerate our soil. I think there’s a lot of opportunity for jobs, especially for young people that want to be farmers. Because the majority of farmers in America are over the age of 80. And I’d like to see some legislation come so young people like me can get some land and start building our soils back. IRA FLATOW: All right, what a great issue, Tom, to take it in-between the ends of the country and to middle America. THOMAS FRIEDMAN: I love the question. It reminds me, earlier a caller brought up Wes Jackson from the Land Institute. And Wes used to have a saying that was, topsoil is so important. We need to stop treating it like dirt. And the point is, what is planet Earth? It’s basically a rock floating in space with this very thin layer of topsoil and oceans, basically, and ice on top of it. And that thin crust of topsoil sustains basically all human, plant, and animal life. And so what the caller is saying is hugely important. Part of my Green New Deal idea was that, whatever money was raised from a carbon tax, would be divided up between all 50 states, with the obligation that we’d have a new Morrill Act. Just as, in the last century, we, had the Morrill Act that created all the land grant universities, a century before. We’d have a new Morrill Act and all money from a carbon tax would go to establish two new community colleges in every state, state could choose where, but it has to be in a rural area. Because I want rural people to feel that they will benefit from this, too. It could be focused on more agricultural orientation, but I want everyone to feel they can be part of this. IRA FLATOW: Well let’s look at some tweets that are coming in from Less who says, where does your guest stand on nuclear and breeder reactors? THOMAS FRIEDMAN: So my view is, I don’t see how we can get to the level of carbon reduction we need, without at least maintaining our current nuclear fleet. Because as far as building new nuclear reactors that’s almost become uneconomical. It’s a bet to business proposition for utilities today. But I sure would be maintaining our current nuclear fleet of reactors, because we’re talking about one gigawatt, basically your average nuclear reactor, and you’ve got to have a lot of solar panels to create one gigawatt. I believe it can be made safe and I would be for retaining it. IRA FLATOW: There’s talking about designating a congressional committee to with this idea, and then at the nuclear, but they’ll– the Green New Deal, but not have subpoena power. Does that matter? THOMAS FRIEDMAN: Well you know I’d have to think about that. I never really thought about it. I wouldn’t want it to turn into a kind of grilling of coal and oil companies. We know all the bad stuff they’re doing. I don’t need to drag them out. I would want it to be positive, inclusive. The kind of thing that would basically be used to illustrate and elevate the coolest green new technologies in the country to date. Don’t think you need subpoena power for that. IRA FLATOW: So give me, in the few minutes I have left with you, give me an idea of a roadmap of how we get to where you would like to go. THOMAS FRIEDMAN: Well I would like to see legislation. Obviously I’d really like to see it in partnership with the administration that would really do for the country what California did, which is to set a benchmark of ever rising standards that would lead and stimulate zero-waste manufacturing, zero carbon emission, electricity generation, zero net-energy buildings, buildings that could generate as much electricity as they give off, and zero emissions transportation. You take all four of those areas. You create a road map, just what you said, Ira, of what are the increasing standards we want every year in all of those? Tell every oil and coal, every auto, every emissions company, every energy company, you’ve got to meet these standards– every building company– of efficiency, in these four areas. And then let just the best one win. Now what the industries will howl is, oh my god, you’ll– and we went through this in the ’70s with seat belts and we went through it with catalytic converters. What they always scream is you’re going to bankrupt us. It’s too expensive. And what happens, in every case, is that they achieve the goal sooner, faster, cheaper. And suddenly, then, they have a competitive edge over their global competitors. If you’re the one making the most efficient air conditioner, that’s going to give you a real leg up in a world we’re going into where that’s going to be needed everywhere around the world. You have the basis of real export industry. IRA FLATOW: Quick call before we have to go to Brooklyn. Alan, welcome to Science Friday. Quickly. THOMAS FRIEDMAN: Well I say it’s a great point. And the big challenge for getting a Green New Deal is that the people who will need it most and who will be affected most by climate disruptions are the very people who can’t vote. They’re young and unborn children. IRA FLATOW: All right, Tom. Thank you very much for taking the time to be with us today. IRA FLATOW: Tom Friedman, Foreign Affairs columnist for the New York Times and author of the book, still in print, Hot, Flat, and Crowded– Why We Need a Green Revolution, and How It Can Renew America. The key to the badminton's speed is the unique aerodynamic shape of the birdie and the kinetic movements by players.